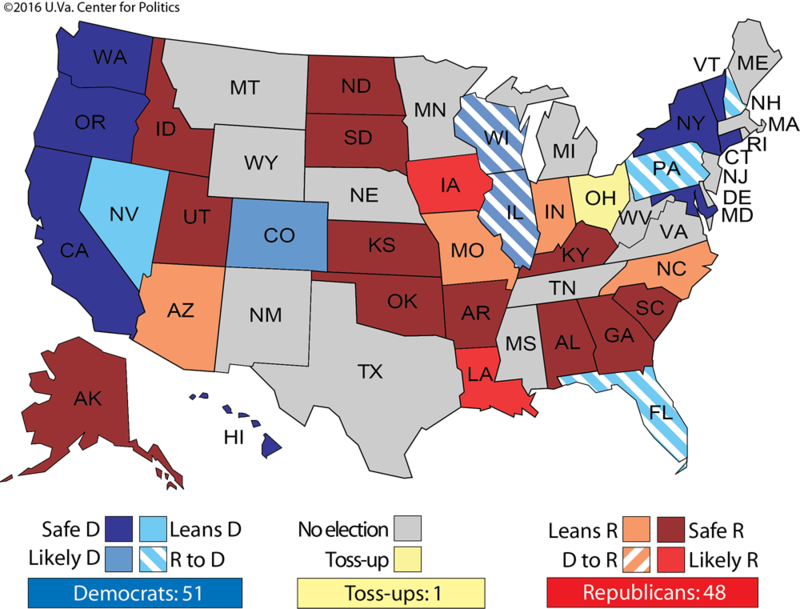 Larry J. Sabato's Crystal Ball » THE TRUMPMARE: CAN THE REPUBLICANS SAVE THE SENATE? THE TRUMPMARE: CAN THE REPUBLICANS SAVE THE SENATE? Let’s have some speculative fun, if such a thing is possible in this election year. After recent primaries, it’s not a stretch to imagine Donald Trump as the Republican presidential nominee; in fact, the odds at the moment favor this outcome. Now, add a second, more controversial projection: Trump loses the general election handily to Hillary Clinton. If you’re a Trump supporter, you will vigorously object. Yet the conclusion isn’t our concoction as much as it is the rather strong belief — and fear — of major GOP officeholders at the national level, as the New York Times reported in an excellent piece over the weekend. On Monday, Senate Majority Whip John Cornyn (R-TX), a former chairman of the National Republican Senatorial Committee, publicly expressed concern about a Trump nomination: “We can’t have a nominee be an albatross around the down-ballot races,” he told CNN. We’ll revisit this subject many times before November, and it is vital to recall that six months ago, virtually everyone in public office and in the election analysis business dismissed Trump as a flash in the pan who could never be nominated. Still, for our purposes here, let’s assume the Republican leadership is correct. What will happen to the most vulnerable part of the GOP elective empire, the U.S. Senate? The Crystal Ball has argued since 2014 that the current Republican majority is very fragile, and that the seats up in 2016 give the Democrats a fair to good chance of takeover — depending on the presidential outcome, in part. 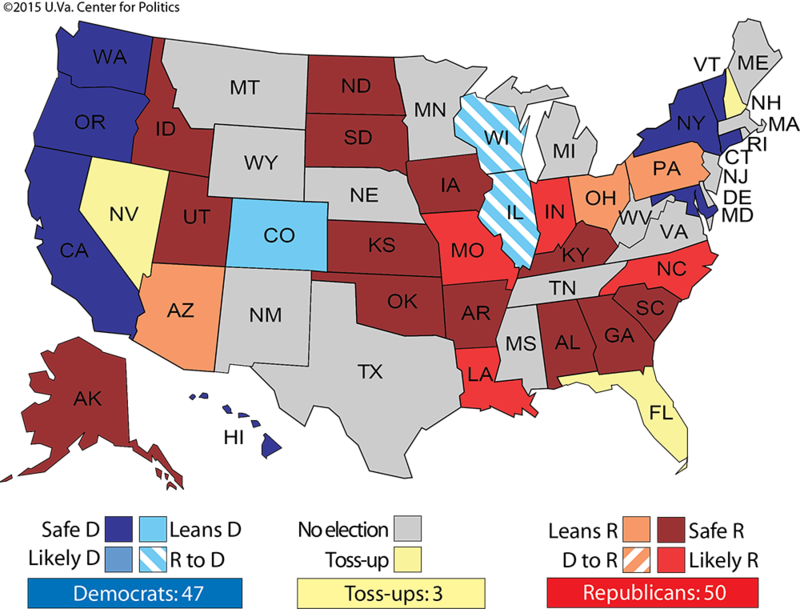 How does a Trump nomination change the Crystal Ball Senate map? First, here are our existing ratings. Thanks to the 2010 victories they won on this map six years ago, Republicans are overextended. Democrats have better-than-even odds of recapturing Republican-held Illinois and Wisconsin, and they have several other targets, while Democrats are defending an open seat in Nevada and another potentially competitive seat in Colorado. Obviously, the map gets much worse for Republicans. 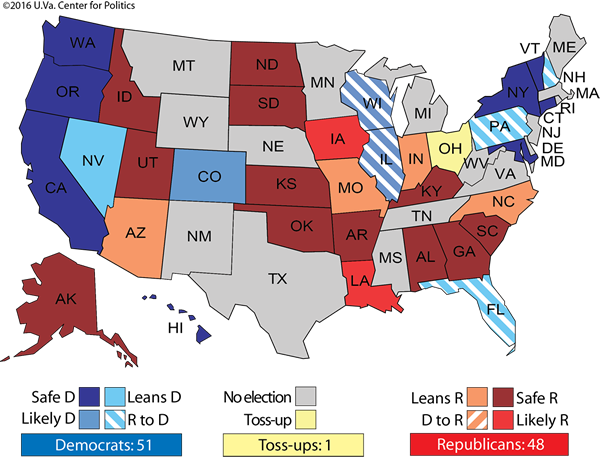 This moves four additional Senate races — Florida, Nevada, New Hampshire, and Pennsylvania — toward the Democrats, and others would become more competitive. Ohio would be a toss-up, while Democratic odds could also improve in places like Indiana, Missouri, and North Carolina. As unlikely as it seems at present, perhaps even a Senate institution, Chuck Grassley (R-IA), the chairman of the Senate Judiciary Committee, could find himself in unexpected trouble, particularly if Republicans find their opposition to holding a vote, or even hearings, on President Obama’s eventual nominee to replace the late Supreme Court Justice Antonin Scalia is unpopular. This scenario seems almost too easy for the Democrats, and politics is always more complicated. So is there any way out for the GOP? Senate Majority Leader Mitch McConnell (R-KY) has reportedly already suggested an avenue for his vulnerable members: Disavow Trump publicly, and even air anti-Trump TV ads outlining differences with him. In Democratic and swing states, this might prove a necessity for Republican candidates — though not enough to save them in every case. Also, intense Trump backers (a redundant phrase) might withhold their votes from RINOs (Republicans-in-name-only) that are turning their backs on Trump. McConnell’s idea triggered memories from 1964 and 1972, years when the parties went off the rails and nominated candidates for president that were not competitive in November. Both Barry Goldwater (R) and George McGovern (D) won less than 40% of the national popular vote. In this age of intense polarization, when voters are motivated as much by dislike of the other party as by love for their own, this kind of showing is highly unlikely. The 2016 two-party results would likely be within the 55% to 45% range, and possibly much closer. Nonetheless, our two historical parallels raise a useful question: How did Republicans on the ballot in the year of Goldwater, and Democrats on the ballot in the year of McGovern, survive the landslide at the top of the ticket? — The most common option among those holding office was, “I’m a Democratic (or Republican) official, and I’m morally obligated to vote for the party’s ticket.” The White House candidate’s name wasn’t even mentioned. This sentence could be uttered with a certain degree of resignation or disgust that the party had put them on the horns of this dilemma. Most of these pols avoided their presidential nominee like the plague, and they were always in another part of their state when the nominee visited. Essentially, they pretended to be in a parallel universe where no campaign for president was being waged. — Almost as common was this construction: “I have my own race to run, and my plate is very full. The voters are completely capable of sorting out the presidential contest without me.” The candidate avoided taking any stand, and demonstrated a kind of humility by acknowledging voters weren’t sitting on the edge of their chairs waiting for his or her endorsement. The opposing party and the news media didn’t stop asking questions, of course, but it was a pat answer for all seasons. Ardent Goldwater and McGovern backers weren’t happy, but most of them were not offended enough to go fishing or vote for the other party’s candidate. — Some officeholders took very principled (or at least definitive) stands and made crystal clear their party’s nominee was unacceptable. Most had already been renominated before having to declare allegiances, so there was no looming threat of a primary defeat. The GOP in 1964 had a large liberal wing in the Northeast and the industrial Midwest, so a stance against Goldwater was easier, even helpful, for some. Mitt Romney’s father, Gov. George Romney of Michigan, aggressively opposed Goldwater prior to the summer convention, and then made obvious that he wasn’t voting for the party nominee during the fall. Romney was reelected governor with 56% even as Lyndon Johnson was winning 67% in Michigan. Similarly, in 1972 Democrats had an imposing conservative wing, mainly in the South and Border States. McGovern was anathema to Old South Democrats, and many incumbents left no doubt they would be voting for President Nixon. A few moderate Democrats tried to straddle the line, but it was a dangerous place to be. U.S. Sen. William B. Spong, Jr. (D-VA), a highly regarded freshman seen by many as a future majority leader, had refused to discuss the presidential race during the fall. But just days before the election, a reporter overheard Spong say he would be voting for McGovern. It generated big headlines at the worst possible time for Spong, and he lost his bid for reelection in a state Nixon won with 68%. The Johnson and Nixon landslides were comparable, with each receiving slightly over 60% of the national vote. Yet LBJ’s coattails were longer. Democrats gained 37 House seats in a chamber they already controlled by a wide margin, and they added two Senate seats as well. By contrast, Nixon had a “lonely landslide.” Republicans only gained 12 seats in the House and actually lost two Senate seats, net. Congress remained firmly in Democratic hands. There were many reasons for the differences, including the fact that LBJ was determined to bring in a swollen majority while Nixon wasn’t nearly as dedicated to his role as party-builder. But surely the skill (or lack of same) with which individual, endangered politicians protected themselves in both years was a key factor. In sum, historical precedent has suggested some possible avenues of escape — or at least management — for threatened Republican U.S. senators in 2016. Whether that’s possible in a more partisan era is anyone’s guess. Clearly, some red state Democrats tried to run against President Obama in midterms in 2010 and 2014, and almost all of them lost. And in the last two presidential cycles, more than 80% of Senate seats were won by the same party that won the state at the presidential level. There’s another way, though, and we’ll have to see if it develops later this spring. What if mainstream Republicans ran a “Real Republican” independent ticket, with a couple of widely respected candidates willing to suffer the excommunication and abuse that would come with such a candidacy? Perhaps the ticket wouldn’t make every state’s ballot, but surely 40 or more states would be achievable. It is impossible to say how many Republicans would choose this alternative, but we’d bet it would be in the millions, and nationally it might garner mid-single-digit backing or more. What’s our point? “Real Republican” voters would be almost certain to vote for regular GOP candidates down the ballot. This ticket could bring out people who might otherwise skip the election — moderates and conservatives who won’t back Trump but also wouldn’t consider casting a ballot for Hillary Clinton. These extra voters could be the margin of victory for Republican Senate candidates. It wouldn’t surprise us if there were more than one such independent ticket, in one case running on an established third-party line (such as the Constitution Party). The more the merrier for incumbent GOP senators — all those votes could be the cushion they need. So many possibilities, so many unknowns in this crazy year! What election watcher could ask for more? P.S. Wait a second: Is Trump really a giant underdog if he wins the nomination? Hey, remember when we and almost everyone else said Trump wouldn’t win the nomination? Well, maybe we all should learn something, and consider a very different scenario. This early on, you certainly wouldn’t make Trump the favorite in November, assuming he actually becomes the Republican standard-bearer. (There are four and a half months until the GOP National Convention. Think about all the things that could happen.) What we’ve all witnessed so far is virtually unprecedented in the annals of American politics. Private citizen Donald Trump has to this point outclassed and outwitted the entire Republican establishment plus 16 other tested candidates, most of whom have lengthy and successful political pedigrees. Clinton, the very likely Democratic nominee, also has a long and impressive political pedigree. But is she more skilled than the entire collection of non-Trump GOP contenders? True, she’s got America’s new demographics in her favor, but she’s carrying lots of baggage (as is Trump). One plus for the Democrats is that they have the mistakes of the anti-Trump Republicans to learn from. Almost certainly, Democrats will not be as shy and as tardy in attacking Trump as were senior Republicans, who only now are unleashing their full fury at Trump. In some ways Hillary Clinton may not be a very appealing candidate, but she and her husband have never hesitated to go on the offensive. They will have a cornucopia of ammunition (as will the GOP for Clinton). The scorched-earth campaign that everyone can see coming will be far more likely to drive up turnout than depress it. Considering that the groups least inclined to vote are Democratic-tilting minorities and the young, sky-high turnout may well help Clinton. Still, while the videotapes of Trump’s outrageous utterances will never go away, he may try to rebrand himself in a general election. This is where being unencumbered by a strong consistent ideology can help a candidate. Trump will have won the nomination by breaking with key parts of the party’s orthodoxy: He opposes cutting entitlements, is anti-free trade, and seems quite supportive of universal health care even as he rips the Affordable Care Act, among many other examples. Trump also had terrible favorability ratings with Republican voters when he entered the fray last summer, akin to his low numbers with the general electorate now. Could he turn his numbers around? We are doubtful, especially because his campaign has often appeared hostile to the nonwhite voters who form the core of the Democratic Party, but after the incredible twists of the past year, we’re not prepared to rule anything out at this point. No one knows the conditions prevailing in the fall, or whether the picture will be fractured by one or more independent and third-party candidates. However, Democrats — and all of us outside the partisan world — would be foolhardy to assume it’s a slam dunk for anyone. When you think you can’t lose, you’re halfway to losing. If it turns out to be a Clinton-Trump contest, the nation will never have been in a comparable place before. Henceforth at the Crystal Ball, most of our meals of political analysis will feature an entrée of caution. We’re assuming that the Trumpmare will leave the Republicans tossing and turning for many nights to come. But wise Democrats should also be uncertain and unsettled in the wee hours. This topsy-turvy election has a lot more servings of shocks and surprises ahead.